In the “old days” conversions occurred via feet on the street, mainly in the form of cold calling and in-person meetings with prospects. Today, business operates a much faster pace and most insurance organizations can’t afford to leave the entire buying process to their sales teams. Instead, forward-thinking companies rely on their marketing departments to generate qualified leads that can be handed off to sales. For the purpose of this conversation, a “conversion” occurs two times – when a website visitor becomes a lead and when a prospect becomes a customer. Marketing typically drives the visitor-to-lead conversions. One the lead is qualified as a good potential prospect; the sales department typically drives the prospect-to-customer conversions. Also, it may be good to clarify that in insurance, this process applies to B2B and larger B2C decisions. If you are marketing a more impulsive product, such as low cost auto insurance, marketing may manage the entire cycle without a sales professional’s intervention. 1. Engaging Web Content: We operate in the age of the empowered buyer. The Internet puts information at buyers’ fingertips so they no longer rely on sales professionals as their only information source. Most buyers seek to educate themselves to some degree before they ever reach out to you. With that in mind, be sure that your website is equipped to educate. Use infographics and charts to illustrate key messages, and use blog articles to provide continuously changing and up-to-date information. On-screen content should make visitors feel comfortable that you are a good potential partner, and it should whet their appetite and encourage them to dig deeper with content offers. 2. Content Offers: For visitors who want to dig deeper, you need to offer premium downloadable content. But there’s a catch – this content is not available to just anyone. Visitors have to complete a few fields in a form to obtain it. If they are truly interested, they’ll probably be willing to do so. If and when a form is completed, the visitor becomes a lead and you’ve attained your first level of conversion. That’s why the form is essential. Without a form, you don’t have a lead. You have no way of continuing the interaction. Top-of-funnel offers: Top of funnel offers are for buyers just beginning the research process. They are recognizing a problem/opportunity and conducting research to gain better understanding. Offers for this audience may include: e-books, white papers, FAQ sheets or guides. These resources should be general (i.e. Why you need a professional liability policy) rather than specific to you – (i.e. Why your company is the best source for professional liability policies). Middle-of-funnel offers: These offers are for visitors who thoroughly understand the problem/opportunity and are looking for the best solution. These visitors are closer to the buying decision and have longer attention spans so you can get into more detail. In fact, they may have already converted on a top-of-funnel offer and now they’re ready for more. Offers may include: Case studies, step-by-step guides, podcasts, videos and solution comparisons. Bottom-of-funnel offers: These offers help prospects make a final buying decision. They may include: Vendor comparisons, trials, pilots, product literature, case studies and get acquainted kits. 3. Content delivery mechanisms: To deliver your content, you’ll need call-to-action buttons, landing pages and thank you pages. A call-to-action button is simply a callout or button that invites visitors to get more information. When visitors click, they arrive at a landing page that sells the offer and includes a form to complete. Once the form is completed, visitors are taken to a thank you page where they can download the offer. In addition, you can present additional helpful information and other related offers on the thank you page. The view-to-click rate for your call to action buttons: Typical is 1-2%. 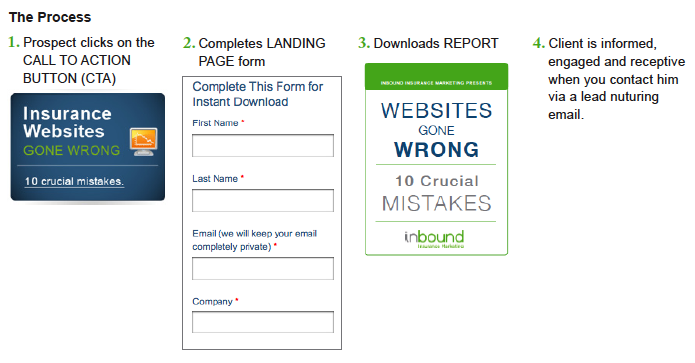 The landing page conversion rate: Strive for at least 20%. Conversion sources: In addition to looking at where your traffic comes from, know where your conversions come from. For example, 20% of traffic, but only 1% of conversions could come from pay-per-click advertising. Meanwhile, 8% of traffic and 24% of conversions could come from social media. You want to invest your insurance marketing dollars into activities that generate conversions. The bottom line: If you like the idea of helping your sales team become more productive, you have to make your website more than just an online brochure. 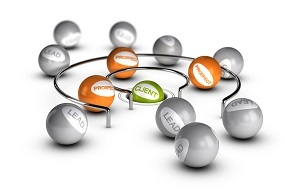 It can become a lead conversion machine if you have the elements listed above. 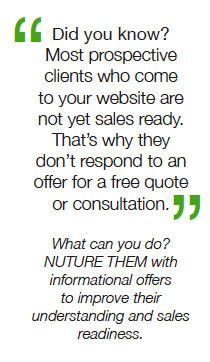 Whenever I speak to clients who complain that their websites don’t generate any leads, this is always the issue – they don’t have offers and mechanisms in place to turn visitors into leads. Stay tuned for part 3 next week – Planning and Budgeting for the CLOSE stage.